When was the last time you actually talked to your customers? I don’t mean a sales call or a demo. I mean actually talking about their business, your business, and how the two virtually affect each other. Our Outbound Sales team has just finalized their their 3.5-month long project of customer interviews. Last week, they presented the results to the whole Woodpecker team. 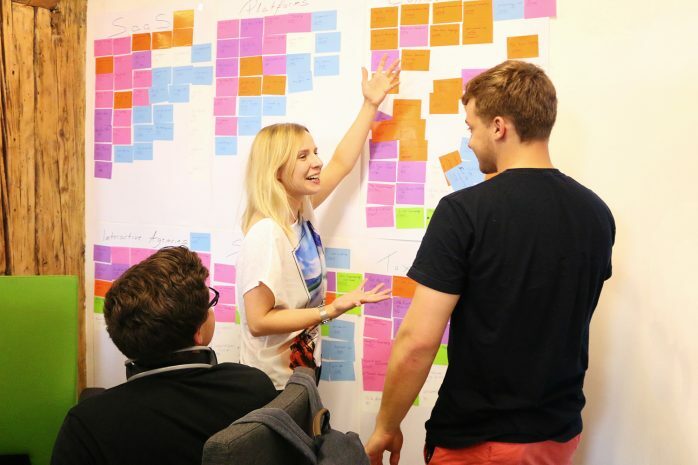 Here’s a report on how they carried out the interviews, what they’ve learned from all that, and how their findings will affect the whole company. Why am I writing about it in the first place? This was a very interesting project that brought us, as a SaaS company, a huge load of information about our best customers. I warmly recommend you running a similar series of interviews at your own company. It seems like an easy enough process: you pick the best clients, you invite them for interviews, you analyze the results, right? Well, in fact, we’ve learned that the process was much more complicated than we’d initially expected. There are many hurdles on the way and it’s easy to get tripped up. This report is supposed to give you an idea on how to structure your own customer interview process and avoid some mistakes that we’ve made ourselves. Get to know the best customers. Discover who they really are as people. Find out what’s important to them in terms of business. Discover their experience with Woodpecker so far. 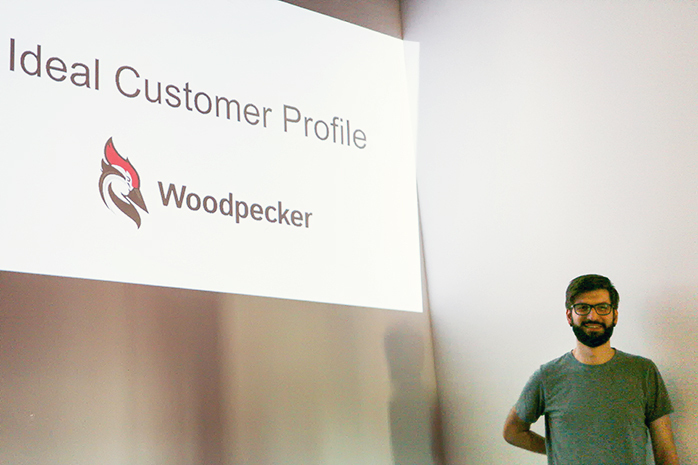 Learn how Woodpecker fits into their business processes. Learn what the most important part of our product is for them. Create a more personal relation with the best customers. Allow them to get to know us as people behind Woodpecker. Validate some hypotheses we had about our Ideal Customer Profile (ICP). Create an up-to-date “ideal customer database” which will be useful in all departments: product development, customer success, marketing and sales. The project was entrusted to our Outbound Sales team – four people in total. Wojtek was responsible for choosing the customers we wanted to talk with and preparing the questions for the interview. Then, Basia and Luke were inviting them for a call and carrying out the interviews together with Wojtek. Monika was consulting the team all the time, but her greatest job was to collect all the findings, interpret them, and get ready for the final presentation with conclusions. The initial goal was to carry out 100 customer interviews with the best customers. How did we define the best customers. have been actively and regularly using our product for all this time. “We wanted to make sure that the feedback we were going to collect was high quality information we could depend on. We assumed that if a company had been actively using our tool for a long time, they must have benefited from using it. We wanted to talk to the customers who had drawn the greatest value from Woodpecker.”– Wojtek explains. In practice, there were several groups of customers added to the customer interview campaign. The team found out that the response rates were lower than they had originally expected. That’s why they were searching through Pipedrive a few times and adding new batches of contacts to their list. 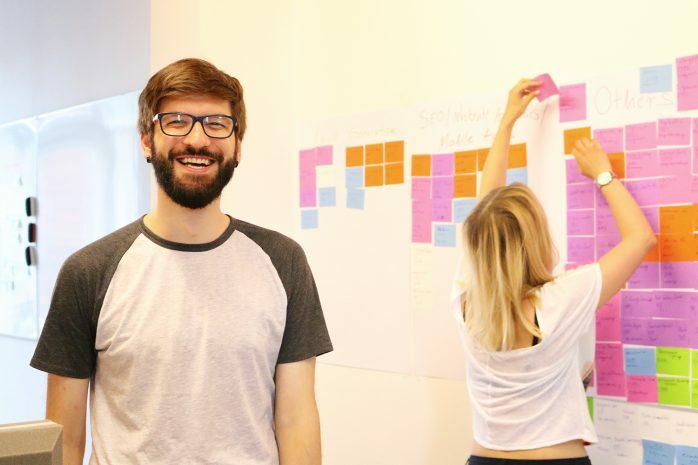 “At first, we were very much focused on achieving the final result of 100 interviews. That’s why we decided to broaden the group of customers we were sending the invitations to. Finally, we talked to customers who were on board for a shorter time, and hence, had much less experience. As a result, the quality of the interviews varies from one customer to another. That’s something we want to avoid next time. – Monika admits. As the list of the chosen customers was ready, Luke and Basia could get about the research and invitations. Their first task was to find some relevant info about each company online. Thanks to this first step, they didn’t have to ask the customers about information they could find themselves before the interview. Plus, the research allowed them to build a context before the interview to make the conversations more valuable and natural. They went back to analogue techniques while organizing the research part – electrostatic post-its turned out to be very helpful in the strenuous process. 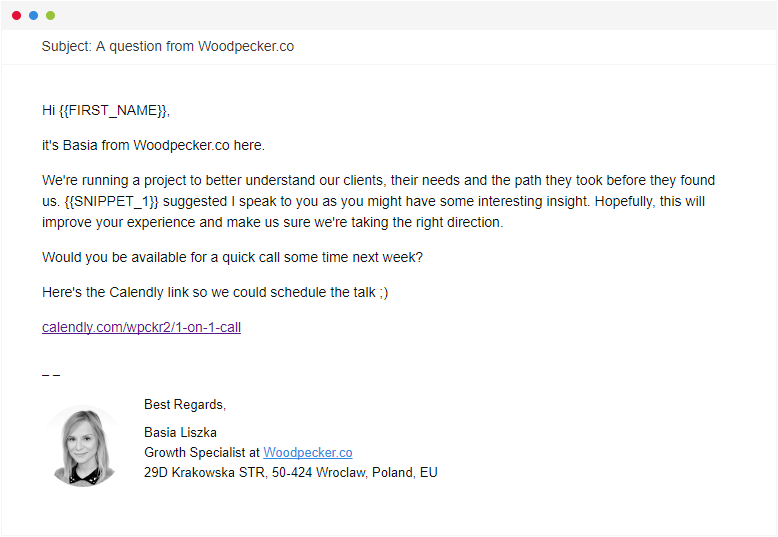 Once a company got researched, a contact from this company was added to an automated email campaign in Woodpecker. This way, the team didn’t have to send each and every email one by one. All they had to do was add a new contact to the prospect list in their campaign, and the invitation, with a follow-up sequence, got scheduled and sent automatically. How did we come up with the questions for the interview? The right questions are definitely a crucial ingredient for successful customer interviews. It’s also important to adjust the questions to your own case. The questions we used may be just an inspiration for the structure of a customer interview. If you plan on running your own customer interview, make sure you spend enough time on crafting the questions. If you can learn something about a customer before the interview, do that. Make notes. Don’t ask about things you don’t have to ask. When planning each of the questions consider what exactly this information by the client will bring you in the analysis. Sieve through the question list. Cut out unnecessary questions. Put the questions in a logical order. Remember that you’ll have a limited time to talk to the customer. You want to learn as much as you can and avoid overwhelming the interviewee at the same time. “Sometimes we skipped some questions from the list, because the client already answered them when talking about something else. You just need to keep up and listen carefully to the answers. It’s best when you can have another person with you to make notes. Then you can focus entirely on the conversation.” – Luke points out. 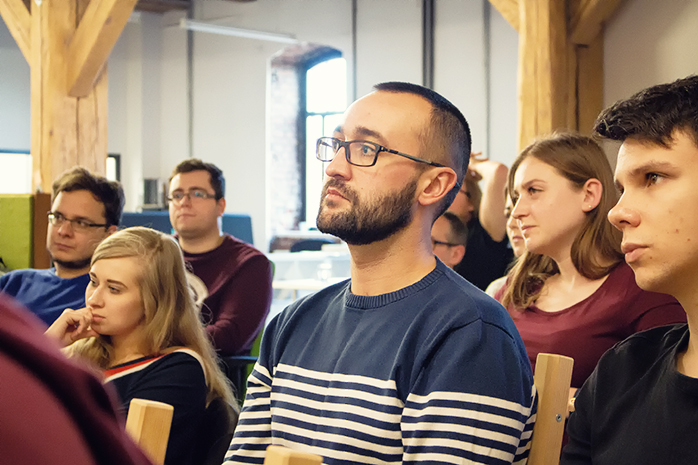 Last week, Wojtek presented the results of the interviews’ analysis to the whole team at Woodpecker. It’s important that the whole team participates in the presentation of the results. Some of us talk to clients everyday. Others haven’t gotten a single chance to talk to a customer ever. You’d be surprised how much value such a presentation provides to those who work on the product and don’t talk to customers on a daily basis. The information we’ve drawn from the interviews will have a tremendous influence on the direction of our growth. Each department learned something new about our customers. This has already given us new ideas on some improvements and new things that we can create to meet our clients’ needs. Just to give you a single example, we’ve found out that 37% of the clients we interviewed saw prospect list building as the most problematic part of their cold emailing workflow. What does that information give us? In product development, we already decided that we should prioritize integrations with prospecting tools to make the process of finding prospects more feasible to our users. In marketing, we know that we should keep developing the Prospecting section on our blog and bring more prospecting tools reviews to our readers. In sales and customer success, we will ask about the process of list building and suggest some workflows and tools to our trial users and customers. In outbound sales team, we’ve been planning a series of webinars. Now we know what the first webinar should be focused on. And there are much more findings like that. If you’re looking for some clues about your development direction next year, customer interviews give you tons of such clues. And they aren’t merely hypotheses you make up for yourself. They are data-driven insights. “We’ve learned so much about our customers and our product. I can tell you that we were different people once we started the interview series and we are different now – much more experienced. This project allowed us to gain so much knowledge and many new skills.” – Luke says. You also get to hear what exact words your best clients use to talk about your product, their needs, and their problems. This may give you some new ideas for messaging in your cold email campaigns. You can attract similar customers by focusing on similar problems and by naming the problems just like your clients do themselves. That’s huge. There are some lessons you can only learn while running the interviews. You can’t predict all the cases and difficulties. We wanted to share what we’ve learned during the project. Firstly, it’s important who conducts the interviews. Luke and Basia were quite new to the team. They haven’t got much experience with the product or talking to customers. On the one hand, the project helped them learn a lot more quickly, gain some knowledge as well as some first hand experience. On the other hand, the customers didn’t know them at all, so the trust level wasn’t that high. Plus, they lacked some information about the product, so sometimes they didn’t know how to answer a technical question or help a customer out. It’s a good idea to make a team of two people, one of whom is more experienced than the other. Next time, we will definitely want to test out an intro from a sales rep or a support person. Let’s say a customer knows Vovik pretty well because he talked to him during the trial period. She would be probably more eager to talk to someone else from the company if Vovik made a warm intro for the new person. We heard some praise, but also some complaints. You need to be prepared for complaints and new feature ideas. Think how you can respond to those before you jump on the call. Always listen politely, and stay calm even if a customer gets emotional. We’ve made some changes to the structure of the interview and the question list during the project. That approach allowed us to make some improvements to the conversations, but in the end we realized that it made things difficult on the stage of the final analysis of the results. If you make some changes, try not to rearrange the question list too. We focused very much on the number of the interviews. But the number of conversations isn’t that important in comparison to the quality of the results. Now we would do this differently. We would rather focus on 30 companies instead of over 60, and only those that matched our criteria 100%. Then, we would follow-up on them until they found some time to talk. And we would try talking to more than just one person from a company. We would like to talk to decision makers and end users separately (sometimes one person fulfills the two roles, but not always.) We would ask them slightly different sets of questions, and we would like to get to know their different perspectives. We think that would bring us much more consistent data for analysis.” – Monika and Wojtek unanimously admit. Sometimes we let the customers go off topic and talk a lot about the things they really wanted to talk to. That’s great when you think about the level of authenticity and naturalness of the conversation, and we learned a lot, too. But in such cases, we usually ran out of time to talk about the things that we needed to include in our analysis. That made the interpretation of the answers more difficult on the analysis stage. 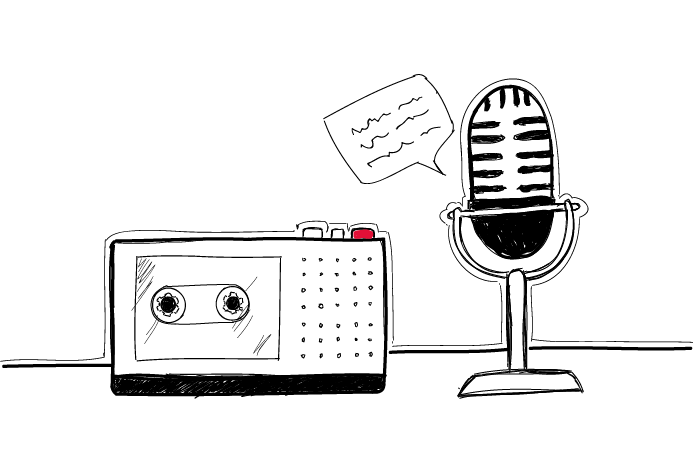 It’s crucial to find the balance between a natural conversation and the interview structure. Sometimes you need to take the conversation back on track. If you are still wondering what you should do next year, definitely put customer interviews on your to-do list. It takes time and it’s a lot of work but it definitely pays off. We will be analyzing our interviews some more, and we’ll be updating our Ideal Customer Profile on the basis of the analysis. This may be a better way for creating marketing personas as well. There’s so much value you can draw from a project like that. So don’t say you don’t have time or you don’t have enough customers yet to do this. Talk to your clients. Learn from them.